Glenn Duncan LPC, LCADC, CCS, ACS has been working in the behavioral healthcare field for twenty six years. He has lectured nationally on many topics including clinical supervision. He is a Licensed Professional Counselor, a Licensed Clinical Alcohol/Drug Counselor, a Certified Clinical Supervisor, and an Approved Clinical Supervisor. Glenn is currently the owner of Advanced Counselor Training, LLC. For 15 years (2003-2018) Glenn served as the Executive Director at Hunterdon Drug Awareness Program, Inc. Responsibilities included the fiscal turnaround of Hunterdon Drug Awareness Program, from an organization heading for bankruptcy and being over $100,000 in debt to being the premier regional outpatient treatment facility staffed with the highest quality clinical, prevention and administrative staff. When Glenn retired from this organization on 08/31/18, the organization had $300,000 in operating reserve and was as clinically and fiscally stable as it ever had been since its inception in 1977. In his current role, Glenn continues to see clients privately in addition to providing clinical supervision for the Administrative Office of the Courts in NJ. Glenn specializes in working with clients who have co-occurring substance use disorders, depressive disorders, and anxiety disorders. Glenn served as an expert panel member for a SAMHSA TIPS book on treating sub-acute anxiety in the substance using population. He also speaks nationally on the ASAM-3 Criteria as a trainer for ‘The Change Companies’. Since 1999, Glenn has also specialized in, and has developed, a customized clinical supervision workshop series that ranges from 24 to 45 hours, depending on the licensure requirements of a given state. He is a leading lecturer for both addictions and mental health professionals regarding clinical supervision. 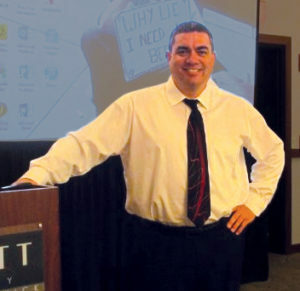 He developed and taught his clinical supervision curriculum for Rutgers University, the New Jersey Prevention Network, as well as privately with his own organization. He has consulted with organizations on how best to enhance their supervisory policy and procedures, and implement best practice strategies. Glenn authored a chapter on the use of live supervision in a community treatment organization for the book entitled “The Use of Technology in Clinical Supervision and Training: Mental Health Applications,” published in 2016. When you see any workshop on this website that does not specifically state who the instructor is, it will be Glenn presenting that conference. NJ Licensed Professional Counselor (LPC), since 1999 (LIC#: 37PC00095000). NJ Licensed Clinical Alcohol & Drug Counselor (LCADC), since 2006, CADC 1999-2006 (LIC#: 37LC00120700). Certified Clinical Supervisor (CCS) since 1999 (CERT#: 171). Approved Clinical Supervisor (ACS) since 2011 (CERT#: ACS01076).